and it was so amazing that I just might have to do it again sometime! 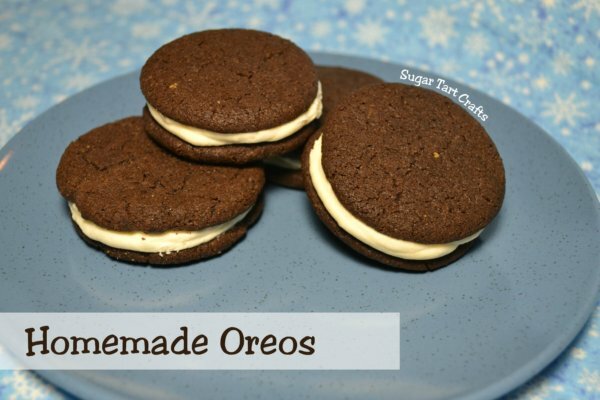 This Oreo recipe that I found at Smitten Kitchen was my absolute favorite new cookie of the year! My wafers turned out crisp, though not as crunch as the originals, and the filling (which I may or may not be addicted to) is more like a frosting than the solid lump of sugar-y goodness that you’re probably used to. Texture factors aside, they taste almost exactly like the regular store bought version. Bring on the milk! The recipe below is written with my changes for less sugar & regular cocoa powder. Click through for the original. Thoroughly mix the flour, cocoa, baking soda and powder, salt, and sugar. On low speed, add the butter, and then the egg. Continue mixing until dough comes together in a mass. Take rounded teaspoons of batter and place on a parchment paper-lined baking sheet about two inches apart. Turn the mixer on high and beat for 2 to 3 minutes until filling is light and fluffy. Pair off your cooled cookies by size. Use a pastry bag with a 1/2 inch, round tip, to pipe teaspoon-size blobs of cream into the center of one cookie. Place the other cookie on top of the cream. Lightly press, to work the filling evenly to the outsides of the cookie. 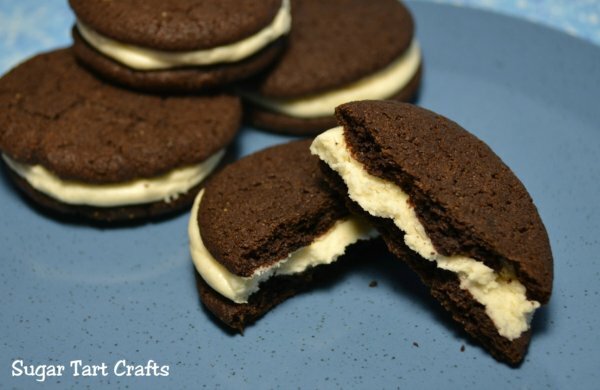 Continue this process until all the cookies have been sandwiched with cream. Dunk generously in a large glass of milk. * Not sure if my cookies were small, but I had a lot of cream left over after they were filled. I ended up taking some of the tops back off and making them more like the Double-Stuffed Oreos at the store. Extra YUM! * Do not store these with a slice of bread, or any other type of cookie. The longer they sit, the more they lose their crispness. Have you ever made a “knock-off” food that turned out just as good as the original? really good things about Olive Garden bread sticks, and also Auntie Anne’s Pretzels. Glad I wasn’t one of those people who made a resolution to get skinny! Ooooh, yum! At first glance, I thought this was a recipe I've made quite a few times, but it's actually pretty different. Yours look much more authentic than mine to the real deal. The recipe floating around my family uses cake mix for the cookies (so they end up being very soft) with cream cheese filling. Nothing like real Oreos, but still tasty. These look delicious, I'm going to give them a try! Mmmm, I LOVE oreos. I'll have to try making my own some time! These look amazing. Found you from the blog hop by Sumo’s Sweet Stuff. I am also your newest follower and hope you will return the favor! Yummy! I will have to try making some! they really have that cookie taste?